Video of funeral for Rabbi Chaim Pinchas Scheinberg, founder of Torah Ohr Yeshiva in Kiryat Mattersdorf and New York. He was 101. Rabbi Chaim Pinchas Scheinberg, founder and head of Torah Ohr Yeshiva in Kiryat Mattersdorf and New York, and member of the Chief Council of Torah Sages of Degel Hatorah, died on Tuesday evening at the Shaare Tzedek Medical Center in Jerusalem. He was 101. 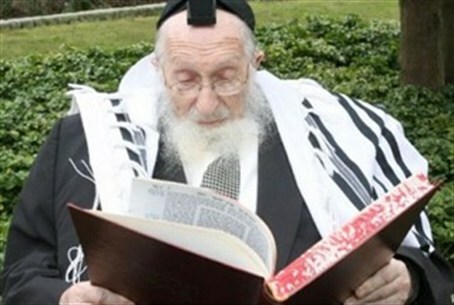 Rabbi Scheinberg was taken to the hospital last Friday, just prior to the start of the Sabbath, after feeling weakness. On Sunday he was reported to be in serious condition. He had been suffering from an inflammation in the kidneys and from an infection in his vascular system. On Tuesday afternoon, the rabbi’s family members were called to the hospital to be at his bedside in the ICU, after his condition deteriorated even further. He was one of the premier leaders of the Lithuanian hareidi religious movement and author of various scholarly works, including Tabaat Hachoshen, a four volume treatise on the seminal halakhic work, Ksot Hachoshen, and the three volume Mishmeret Chayim where the analysis of dilemmas illustrates the Talmudic method of study. He was especially well-known for wearing more than 36 layers of tzitzit (fringed four-cornered garment) and keeping on his tefillin (phylacteries) all day. He remained active in the daily affairs of yeshiva life despite his age, including in fundraising for the institution and in responding to Jewish legal questions. The great Torah sage, born in Ostrov, Poland in 1910, moved to the United States at the age of nine and spent his early years studying in the Rabbi Jacob Joseph Yeshiva (RJJ) on New York's Lower East Side. He continued his Torah studies at Rabbi Yitzchak Elchanan Yeshiva and then at the Mir Yeshiva until moving to Israel. In 1965, Rabbi Scheinberg, his family and his driver, Rabbi Asa Wittow and family, moved into the newly-developed neighborhood of Mattersdorf from New York, where he had previously established the Torah Ohr Yeshiva in the Bensonhurst neighborhood of Brooklyn. The rabbi established Israel's Torah Ohr yeshiva that same year, first in Givat Shaul and then eventually moved it in 1971 to its present building in Kiryat Mattersdorf. At present, nearly 800 rabbinic students attend Yeshiva Torah Ohr in Israel, including more than 500 post-graduate Torah kollel scholars. Rabbi Scheinberg is survived by four daughters and a son. He will be laid to rest on the cemetery in the Mount of Olives in Jerusalem, where he will be buried next to his late wife.